It was a dark, rainy day for our sketchcrawl in Stevens Point today, so not many sketchers showed up, only two: Aaron Kadoch and Kathe Julin. We posted our photos to share with the group. 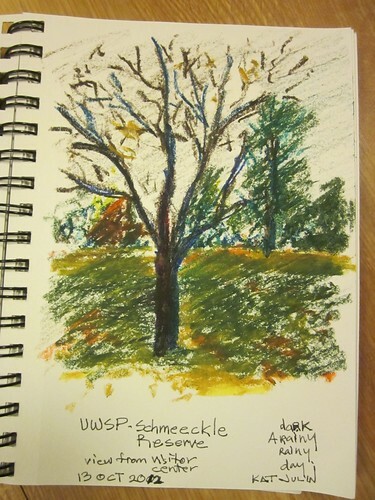 Enjoyed the day and the opportunity to be out and about sketching at the UWSP campus. 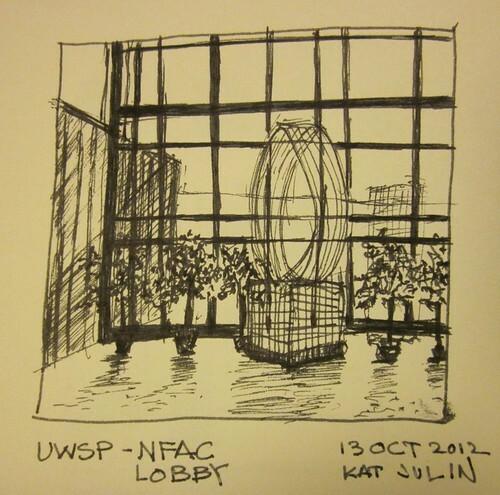 We posted our sketches to the UWSP Division of Interior Architecture Website and here for the UWSP students to see and encourage them to join us next time. Sketching, rain or shine! It was a dark, rainy day for us. Aaron noted "While sitting at the student center at UWSP this rainy Saturday morning, there was a stillness inside, while the wet pavement outside smacked drop by drop." Warm and dry inside. A quiet day for sketching. The rain kept people away unfortunately. 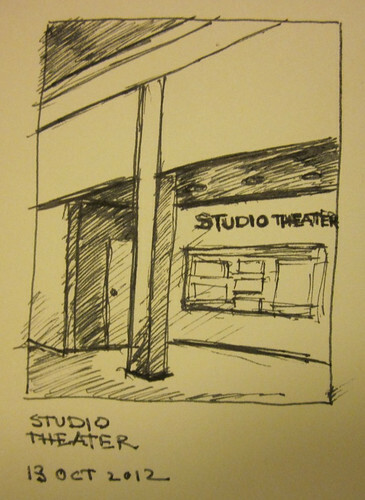 UWSP NFAC building -the outside of the black box theater. 37th World Wide Sketchcrawl today at UWSP Campus. A very dark, rainy day. stayed inside buildings to sketch looking out windows. In visitor center at Schmeeckle Reserve on UWSP campus. 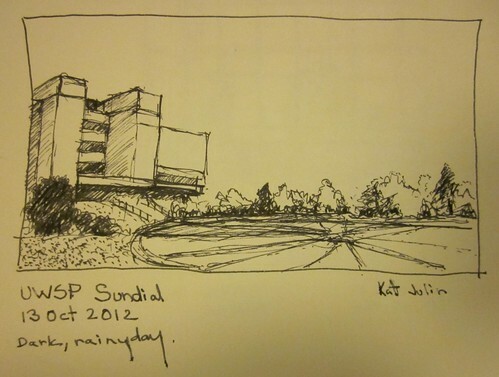 Aaron and Kathe out in the UWSP Sundial forthe 37th World Wide International Sketchcrawl. 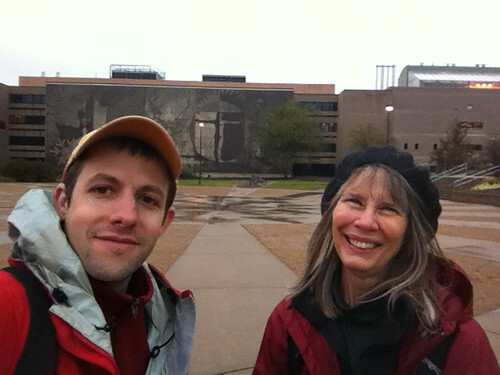 Tile mural of Natural Resources building is behind us, as we brave the cold and the rain. At the end of the day, I went to the Central Wisconsin Symphony Orchestra Avian Fantasy Concert and a student, Carolyn Matthews, played cello during the intermission under the direction of Dr. Lawrence Leviton. 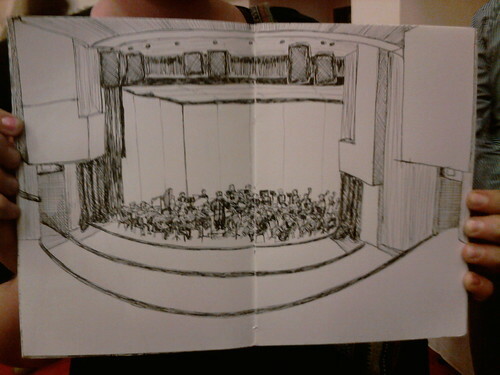 Then in true interdisciplinary collaboration, Carolyn participated in an end-of-the-day sketchcrawl doing a sketch of the symphony orchestra as Dr. Leviton (principal cellist) performed with the Symphony along with Dr. Steven Bjella (principal violinist who played a wonderful solo at the event). A delight for all in an avian fantasy theme. Carolyn is playing her cello second from left. 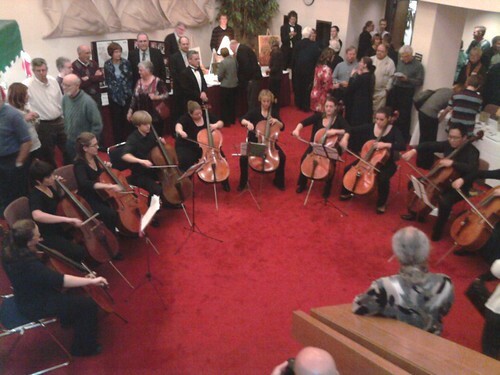 Dr. Leviton is standing behind the fifth cello student from the left of the semi-circle. 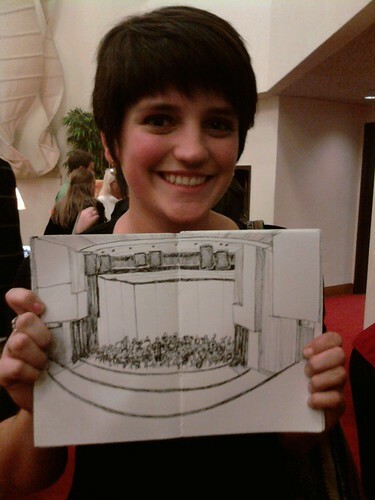 Carolyn came to share her sketch after the concert and I was delighted to see it and include it with our day of sketches. What a surprise and a wonderful way to end the day. Last edited by kjulin on Sun Oct 14, 2012 3:41 pm, edited 5 times in total. This is really a good way to get people out to sketch and I hope we get more involved in the next SketchCrawl. It was a good day! Good for you for getting out in the rain! You all did a great job on your sketches, and Carolyn... one very talented girl!